Throughout the history of Formula One, there are races which stand out above all else. Races that in one afternoon catapult a driver from also-ran to household name, or ruin a reputation built up over the course of decades. These are the stories that we all remember, the ones we love and the reason why we tune in each and every Sunday. The opening round of the 1990 Formula One season was the first race since Alain Prost won the title from McLaren team-mate Aryton Senna, then swapped seats with Gerhard Berger at Ferrari. Even though Prost was champion, Senna felt that it was a title won through inappropriate means. The winter period was focused on the war of words between the two. In other events, the tyre war between Goodyear and Pirelli raged on as teams picked sides. Most of Pirelli’s customers were lower midfield and backmarkers looking to keep costs down, while Goodyear continued to work with the front runners. Tyrrell, after 18 years of business with Goodyear, switched to the Italian company just two days before the race, to the surprise of the whole paddock. It was to prove inspirational for what was to come. The race in Phoenix was moved to March to avoid the summer heat, only to have the opposite effect. Rain affected the Friday session, meaning that the grid had to be decided on Saturday. With that, some unusual names appeared in the top ten, like Andre De Cesaris in a Scuderia Italia, and the biggest shock of them all, Pierluigi Martini in a Minardi on the front row for the first time in the small Italian team’s history. Pole position was the familiar image of a McLaren, but with Gerhard Berger behind the wheel instead of Senna, out-qualifying the great Brazilian at the first attempt. The top four read Berger, Martini, De Cesaris and the Tyrrell of Jean Alesi, starting his first full season in F1. Senna could only manage fifth. Race day was cool with a chance of more rain, but it stayed dry for the duration. The start was even more important than usual, because of the haphazard make-up of the grid. Berger quickly pulled ahead of Martini and moved over in front of him but Alesi, whose F1 career had begun in his home country of France the previous summer, made an even quicker start, passed them both and outbraked Berger into the first corner. He immediately began pulling away, and led by 2.4 seconds after one lap. Senna got by de Cesaris for third, and closed on Berger, who was giving up a half-a-second a lap to Alesi. The Brazilian got by his teammate when, on lap 9, Berger hit a bump under braking, backed into the tire wall and damaged his rear wing. He pitted for a new wing, and recorded the fastest lap of the race, but eventually retired with a clutch problem. When Berger spun, Senna was 8.2 seconds behind Alesi. Not knowing whether the Tyrrell’s Pirelli tyres would last, Senna was reluctant to push too hard early on. The Italian rubber had proven its durability when, after 30 laps, Alesi remained in the lead. Patiently waiting for an opportunity, Senna slipped inside Alesi on lap 34, but he was shocked when the Tyrrell held the outside line on the exit and took the inside on the very next turn. Even though his car was underpowered in comparison to the McLaren, the twisty nature of the Phoenix track and the extra grip of the Pirelli tyres meant that he had a car that could match the great Brazilian. At the very same point on the racetrack one lap later Senna pounced again, this time making sure he had the proper line through the short straight to the next turn to hold onto the lead. 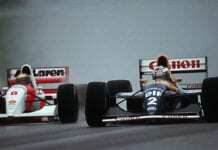 After several attempts to regain first position, Alesi decided to conserve his tyres and let Senna go. Meanwhile, Nelson Piquet had progressed from sixth on the grid to third by lap 17. Brake trouble caused him to flatspot his tyres however, and on lap 28 he pitted for fresh rubber. This allowed Thierry Boutsen’s Williams through, and though he battled a problem with his engine intermittently cutting out, he maintained third place to the flag. Piquet had to settle for fourth in his first drive for Benetton. Alain Prost had fallen back to ninth at the start when he couldn’t select third gear and, while he advanced to fourth place by lap 17, his gearbox troubles proved terminal on lap 21. In the other Ferrari, Nigel Mansell’s departure on lap 49, while running fifth, was more spectacular. On the straight at 160 mph, his clutch disintegrated and pierced the oil tank. The engine seized and erupted in a huge fireball, sliding all over the track. Mansell somehow controlled the spin and was able to stop safely. Senna built his lead over Alesi to 28.5 seconds, but backed off slightly when his engine began sounding less than healthy. Stefano Modena and Satoru Nakajima, in a Brabham and the second Tyrrell respectively, respectively, finished the scoring in fifth and sixth places. 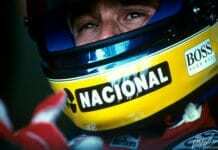 It was the 21st win of Senna’s career and the first of six for the season. The Brazilian would go on to win his second World Championship. Alesi scored the first podium finish of his career. It’s not often that a career-defining race comes along in this sport. In recent years it has been very hard for a driver to make a name for himself in one race or at one event – it’s more likely to happen over the course of a season. In the ‘80’s and ‘90’s it was a different story. In an under-funded and under-powered team Jean Alesi had challenged one of the best drivers in the world and given as good as he got. Another second place in Monaco, this time fending off the McLaren of Berger, only solidified the fact that a new star was rising in Formula One. The next time F1 made its way to Phoenix, Jean Alesi had replaced Nigel Mansell at Ferrari, a drive that he had dreamed of his whole career. Five years at Maranello did not meet the potential that it could have, with only one win to his name, at Canada in 1995. The tifosi though, judges of characters that they are, took to him just like other drivers such as Gilles Villenueve. Even through the twilight years of his career at Prost and Jordan, the fire still burned occasionally. His career may have been less bright, but that overcast afternoon in Phoenix it simply exploded.